"Ancient wisdom reveals solutions for immediate abundance for humanity. 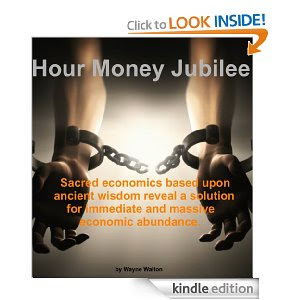 This book uses sacred economics to create a victory plan not phony austerity measures and fear mongering. History repeats and we face the same debt problems which existed throughout ancient history. Powerful, actionable solutions are available without displacement, despair and hardship. We just need to ignore loyal opposition gate keepers who are hired to protect the status quo. Real revolution requires usuryfree money creation and lending. Interest based economics creates an un-payable debt Ponzi. Jews, Christians and Muslims all forbid usury before being corrupted by the "money power". We will actually have far more money, lending and banking without interest. Discover how interest is a mathematic fraud like a Ponzi. Discover how usury-free societies offer a 15-25 week work year. Learn this information yourself so that you are no longer deceived by the "money power". Bring this message of hope and abundance to your family, neighbors, friends and countrymen. Become the leader that you were meant to be." "Hello, My name is Wayne Walton. I’m a monetary reform activist, humanitarian and evolutionary. The economic, political, social and environmental problems we face today are symptoms of a corrupt monetary system. We have institutions which don’t represent the best interests of humanity. Often one must do work which destroys their soul just sustain life. Those who do the least for humanity make the most money. Those who do the most for humanity often make the least money. All of these are flaws of a monetary system which is centralized and created as a debt with interests. The “money power” named Mammon controls the system of rewards in any society. Presently, that system rewards the worst human values. Throughout history humanity has struggled to remain free from the Babylonian money system. A debt and usury based money system is mathematically guaranteed to turn the majority into debt slaves. The tiny few will dominate the many. Over time debts will increase exponentially for individuals and governments. Producers cannot keep up with compounding debts of the parasitic usurers. Increasingly more human and natural resources are committed to feed the Beast. In nature exponential growth is the sign of sickness like a cancer or virus. Usury fueled debt is the virus that is destroying our humanity and environment. Before being corrupted by the “money power”; Jews, Christians and Muslims all forbid usury, interest and riba on money creation and lending. They learned mortal lessons over thousands of years. Each of those societies resisted the “money power” in the ultimate spiritual battle of good vs evil. They were debt slaves like us too. Though corrupt money; they too had their own energy used against themselves. They were divided and conquered by the Beast. Political systems were set up to pit debt slave against debt slave. Brother against Brother were in conflict while the puppet master ruled from behind the scenes. They saw their humanity destroyed by Mammon. To warn future generations, lessons were written in stone. NOTE: Read and re-read the book and then invite others to follow your lead - thereby multiplying and duplicating your efforts to accelerate the re-education of the masses on the truth about (a) the many problems associated with modern money creation and (b) the solution as offered by the growth and evolution of the usuryfree time currency movement. The Global Elite: Who Are They?